LA Unified is on the brink of a severe financial crisis and if officials don’t act now, the whole district could go bankrupt. That’s the overall conclusion of a report by an outside panel asked to look at the financial situation of LAUSD. Its findings are scheduled to be presented at the regular school board meeting Tuesday. The Report of the Independent Financial Review Panel also contains strong recommendations that involve cutting staff, curtailing health benefits and finding strategies to keep more children in school. This report represents a collaboration of professors, politicians, business leaders and education experts, appointed by district superintendent Ramon Cortines six months ago. The group confirmed a lot of what the district already knew: that LAUSD will face a budget deficit of $333 million in the 2017-2018 school year, $450 million the next year and $600 million in 2019-20 — all driven primarily by a declining enrollment and increases in pension and healthcare costs. Upwards of $400 million by offering early retirement to senior level staff. $100 million by negotiating a cap on district health care. $57 million by shifting 10 percent of the cost of health care benefits to employees. $45 million by increasing attendance rates to the statewide average. $50 million eliminating general fund contributions for Food Services. $10 million by eliminating the Teacher Pool, where displaced teachers are used as substitutes and paid a higher rate. The panel also recommended that the district consider pushing for passage of a parcel tax. The membrs found that compared with other states, California has a portion of school funding provided by state income and sales tax that is much higher than other states but the role of local property tax is much lower. The report finds that the per-student funding level for LAUSD, the second largest district in the nation, is about $12,691. The nation’s largest school district, New York City Public Schools, provides nearly double, $23,690. In fact, LAUSD’s revenues fall $1,659 per student below the average revenue amount for the top 10 districts in the country. 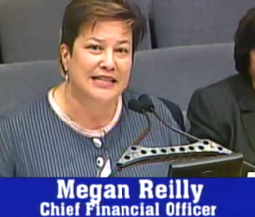 If LAUSD received this funding, total funding would be about $800 million more per year, the panel said. “It is clear that the effect of California’s ranking near the bottom of the nation in per-student funding has taken its toll on LAUSD finances,” the members wrote. 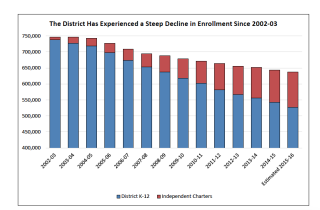 One of the biggest reasons that district is suffering financial losses is the decline of enrollment. In six years, LAUSD has lost almost 100,000 students and now serves about 550,000 students. About half of the loss of students is because of enrollments in charter schools, but about half of the students are simply because of low birth rates as well as students dropping out of school or transferring to other school districts. This, of course, is all before the start of a Broad Foundation plan to move half the district’s students into charter schools within the next eight years. Among some of the specifics in the report, the panel found that if even the teaching staff had a better attendance rate, improving from the current 75 percent to a 90 percent, it could save the district $15 million a year in costs for substitutes. The district could also save money by looking at using the Federal Affordable Care Act as the standard for retirees or consider going to a 90/10 contribution rate health benefit plan that could save $57 million.